One of the very special things you can see during the Share.ams launch is Justin Magness’ installation Holler Monster. Media artists and technicians, come to SHARE in Amsterdam. 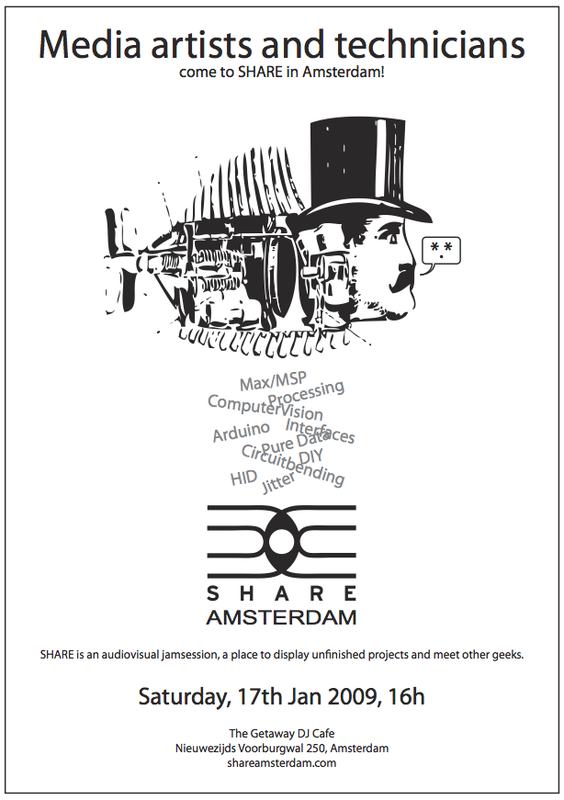 On the 17th of January 2009, media artists and technicians will come together for the first SHARE event in Amsterdam. SHARE is an audiovisual jam session, a place to display your unfinished projects and meet other geeks. We’re hosted by a great little venue in the very center of the city, next to Dam square: thegetawaycafe.com. Free Wifi, 220V and Tapas. We are extremely good at improvisation, so let us know if you have installations to display, a short talk to give or one-liner statements to make. We feature an automatic visual jukebox so be sure to bring your muddy pictures, shaky video’s and screenshots of half-finished software. The event will be streamed live on our livestream page. We’ve just added a Program page to our site, where you can see what we had in mind for the launch event of Share Amsterdam! In short: installations, nice people, workshops, djs, vjs, talks, intriguing techniques, never-seen-before hardware and software, etc. You can also subscribe to our RSS feed and keep updated on site content changes! You are currently browsing the share.ams blog archives for December, 2008.